Minnesota was reaping the grapes of Mother Nature’s wintry wrath when Aimée Dayhoff arrived at the Radisson St. Paul hotel to staff the Winthrop & Weinstine booth at the Minnesota Grape Growers Association (MGGA) Cold Climate Conference in St. Paul. A blizzard raged in full force throughout that mid-winter weekend in 2013. The weather underscored the purpose of the conference, which was to spread knowledge about the how’s and why’s of growing grapes in climatic conditions seemingly more suitable for the cultivation of Christmas trees and quick-growing grains than the essential ingredient to the vintner’s trade. Dayhoff led the charge to get Minneapolis-based Winthrop & Weinstine involved in the conference as an exhibitor. Now as she and an associate applied their crowd-working charms over that blustery weekend, the investment proved itself fruitful. “We began opening some doors that weekend,” she says today. The “sequence of events,” as she puts it, that led to her and Winthrop putting a focus on the wine industry began when she read an article about Wisconsin and Minnesota wineries winning some wine industry awards. Intrigued, she sent letters of congratulations to each winner, along with a Winthrop & Weinstine branded wine opener. One of the wineries contacted her for business reasons, and “that’s how it started,” she says. Winthrop already had an attorney with craft brewery expertise on staff. “We saw the similarities between the two businesses [beer and wine production],” says Dayhoff, a partner at Winthrop & Weinstine. After some digging into industry fundamentals, Dayhoff realized that the industry was beset by legal complications — and that there weren’t many competing firms active in the business. She decided to spearhead an initiative to position Winthrop as the go-to law firm for Minnesota wineries. Minnesota’s farm winery law sets it apart from other states, she says: The law permits agricultural land to be converted to grape-growing and winery uses, although there are many steps that wineries must complete to comply with the law. The gregarious Dayhoff found ways, such as exhibiting at the MGGA conference, to introduce herself and the firm to the state’s wine-makers. Nan Bailly runs the Alexis Bailly winery today. She took over the reins from her late father, who started the winery in 1973 and produced Minnesota’s first commercial wine. She gladly acknowledges Dayhoff’s kind words about her winery, but notes that the MGGA has not supported her and a second Minnesota winery in a lawsuit challenging the Minnesota law requiring state wineries to produce wines containing at least 51 percent Minnesota grape content. Supporters of the majority Minnesota-grown grape content law argue that it is essential for Minnesota growers to build a brand identity for the state’s wine industry. Dayhoff, who served as an MGGA board member from 2016 to 2017, doesn’t take a stand on the issue per se but notes that the state does allow for wineries to apply for an exception to the rule — and that such exceptions are most often granted. U.S. District Court Judge Wilhelmina Wright shot down the lawsuit in April. Bailly says she plans to appeal the decision to the 8th U.S. Circuit Court of Appeals, arguing that the Minnesota content law imposes unconstitutional sourcing restrictions on wineries. The MGGA does not support the lawsuit. The legalities of operating a winery in Minnesota can be daunting, Dayhoff says. Whether it’s someone wanting to set up a wine-tasting room in Hennepin County or someone just wanting to grow vines somewhere in the state, strict governmental rules must be followed. IP issues also come up frequently among her clients, she says, especially with regard to trademark issues. Wineries can also stumble over the rules for classifying workers as independent contractors, she says. 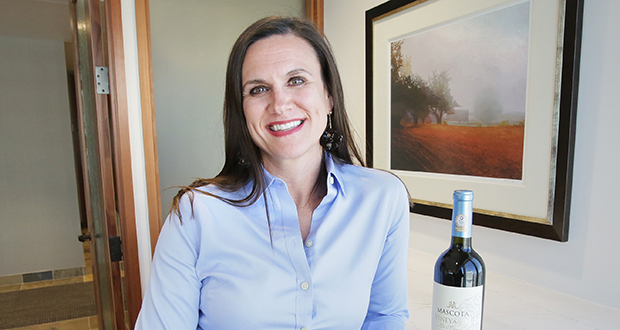 She advises wineries to deal with the legal issues upfront, rather than after the fact. “It’s much cheaper to do the work in advance, rather than after the fact,” she advises. Close encounters with different culinary traditions were rare. “The first time I tasted Chinese and Italian food was when I visited relatives in New York as a kid,” she says. Seafood was fine for sea creatures, but not for people of the land. “I didn’t even like to eat cooked fish,” she says in recalling the time that a fellow she met in Washington, D.C. — later to become her husband — took her to a sushi restaurant. Raw fish? Really? Now she loves sushi, along with a host of other cuisines. “We’re both foodies” today, she says. She and her husband also enjoy traveling to food-and-wine-rich destinations, such as Napa Valley, and also internationally — Chile, Portugal, the South of France, Tuscany. “We just came back from a trip to Tuscany,” she says. They rated royal treatment from the Tuscany wineries, thanks to an introduction from a Twin Cities wine shop owner with Tuscan connections. The home-grown restaurant scene in Minneapolis offers a variety of cuisines for discerning diners such as the Dayhoffs, too. “We love to check out local restaurants,” she says. Among her favorites are The New Grand Café, Tenant, Young Jonie and the NoLo Kitchen. The Twin Cities area has developed a national reputation for fine dining. Can the state’s wine industry follow suit? Although not a board member of the MGGA, she still speaks on legal topics at its annual conference. “Every conference, I see more people getting involved in the industry,” she says. “The MGGA continues to work on developing concepts to promote the wine industry,” she adds. One work-in-progress is the development of more well-defined wine regions, such as a Napa Valley, within the state, according to Steve Unverzagt, a Twin Cities-based wine industry consultant and former executive director of the MGGA. Both state and federal rules come into play in the development of winery festivals and what the federal government calls AVAs – short for American Viticultural Association. AVAs lend themselves to geographic marketing distinctions. California offers up more than 600 AVAs, Napa and Sonoma among them, while Minnesota wineries participate in just two AVAs. One of them is the Upper Mississippi River Valley AVA, encompassing portions of southeastern Minnesota, Wisconsin, Iowa and Illinois. Dayhoff has helped the MGGA understand the legalities of the federal AVA process, Unverzagt says. Whether state wineries, relying primarily on Minnesota-grown grapes, can compete on a national scale remains to be seen, she says. “It’s still more of an infant industry,” she says. She cites the example of Minnesota as the development source for the Honeycrisp apple — “possibly the best-tasting apple in the world” — as a beacon for the state’s grape growers to follow. “I’m pretty optimistic about the wine industry in Minnesota,” she says.